Southern society is arranged along matriarchal lines, since the Southern matriarch is a far more formidable being than the much nicer Southern male. She has to be this way; she was put on earth with a sacred mission: to drum good manners and the proper religion-ancestor worship-into the next generation. In Some Day You'll Thank Me for This, Gayden Metcalfe and Charlotte Hays, the bestselling authors of Being Dead Is No Excuse and Somebody Is Going to Die If Lilly Beth Doesn't Catch That Bouquet, deliver up a hilarious treatise-complete with appropriate recipes from those finicky, demanding moms-on the joys, trials, and tribulations of being the daughter of a Southern mother. 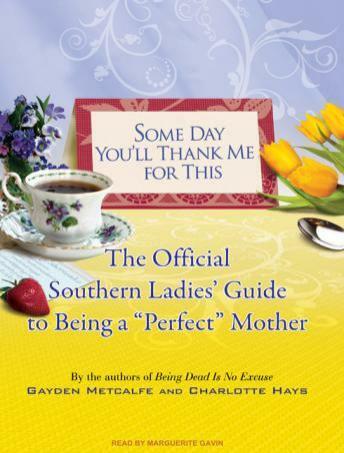 Including such chapters as 'A Crown in Heaven-The Southern Mother's Ultimate Passive-Aggressive Fashion Accoutrement,' 'Grande Dames and Other Mothers,' and 'Grandmothers: Why Precious Angel Baby Grandchildren Are So Much More Fun Than Granny's Own Bad Children,' this is the perfect gift for any Southern mother-or the daughter of one.